It’s nice to live in a society that recognises the necessity for female entrepreneurs and women in business. One that celebrates their success and achievements across a variety of fields, on an international stage. Only over the last sixty years is when we’ve seen revolutionary changes that began to shape the status of women in business. Women entered the workforce in large numbers during WWII. Several hundred thousand women, across the globe, took administrative positions, became nurses, truck drivers, mechanics, electricians and auxiliary pilots. It was the first time that women were granted some measure of freedom to pursue a career, outside of the home. The fire for equality had been lit and post war, women began to assume managerial positions in corporations that operated around the world. Female entrepreneurship was invigorated by the feminist movement and national legislation that encouraged equal opportunity in the 1970s. A TIME Magazine article from August 1970, entitled ‘Who’s Come a Long Way Baby?’ expressed shock at the demand for equality within the work place, particularly the fight for equal pay. By the late 1980s, women increased their share of managerial positions and professional speciality occupations from seven percent to forty seven percent. As a female entrepreneur, I think it is essential that we remember the trail blazers that paved the way for us to become the greatest versions of ourselves, such as Gloria Steinem, Susan Brownmiller and Kate Millett. It is also important for us to support and celebrate the accomplishments of today’s inspirational women in business and beyond. I recently came across an article from Porter magazine, the Winter edition, entitled ‘Incredible Women.’ The piece is a celebration of the women who inspired and empowered the world throughout 2018. It was only in November 2017 that the #MeToo movement erupted beginning with the film, fashion and other alike industries. Porter’s theme for this article was inspired by those amazing women that stood up and spoke out; One Year Stronger. The article also features ‘Women of Action working to change the status quo,’ with particular attention to women who are advocating for both female and human rights, such as Emma Watson, Frances McDormand and Emma Gonzales. A section of the article is dedicated to the empowered women in sports, who ‘rocked it when it mattered’ this year. If features our very own, Olympic gold medalist, Tessa Virtue, Grand Slam winner, Caroline Wozniacki and Chloe Kim, the youngest woman to ever win an Olympic snowboarding medal! Go Chloe! The write up also lists the dynamic female game-changers and ground-breakers of 2018, which include; Rachel Morrison, the first woman to be nominated for the cinematography Oscar, Courtney Monroe, CEO of National Geographic Global Networks and Hu Weiwei, co-founder of Mobike, the world’s first bike-sharing app. I love articles like this one that observe and honor the accomplishments of females in business. What I took from this article was that we should never underestimate the power of women connecting and supporting each other at work and in life. Even with 950,000 self-employed women in Canada in 2012, accounting for 35.6% of all self-employed persons, being a woman in business, as we know, can still be challenging. For example, dealing with limited access to funding, balancing business and family life and building a support network in the high-level business world, which is still dominated by men are challenges faced by women in business every day. Confidence is key. Whatever your industry, confidence will help you earn respect and advance your career. Being unsure of yourself will only allow others to have little faith in your abilities. I learned that women typically apply for a job or have confidence in themselves when they are 100% qualified for the job whereas men usually a little less ;) So I say. Never downplay your worth. Exposure. Going to site, into the field or taking a seat at the table, as frequently as you can is vital. You will be exposed to others in the industry (network, network, network!) and it can be the greatest place to learn about your industry. 'Mentorship through osmosis' as Johanna Hurme, from 5468796 cleverly 'coined' the term to describe how employees can learn through observation. All of the speakers believed in an open work environment where employees could frequently interact and engage with more senior members of staff and their daily work habits. Building a support network that will empower women to achieve their goals in business is also vital for success. It is important to recognise organizations that help achieve this, such as The Women’s University Club of Vancouver. The UWCV promotes education, rights and opportunities for women and brings the arts and culture of Vancouver to Hycroft. It was the second University Women’s Club in Canada and founded on May 11, 1907 by a group of eight young women graduates of universities in Eastern Canada and the U.S.A. In June 1962 the University Women’s Club of Vancouver acquired Hycroft, a magnificent Edwardian mansion located in Shaughnessy to use as its Clubhouse. At that time women were not permitted to hold a mortgage in their own name, so they were required to pay in full. It took a full year for UWCV to finalize the purchase of Hycroft and five more to restore it. I am looking forward to becoming a member of the UWCV in the near future! Every year, on the last week of September IDS West takes place in Vancouver. It is perhaps one of my favourite weeks in the year and a widely popular event for those in the design community. I spent the weekend walking around the expo, soaking up the design and creativity from individual designers, artists, makers and design-centric brands who were showcasing their current concepts and products. I also attended some fascinating seminars and had the opportunity to hear from some of the design world’s most notable and talented personalities, some of which have notable mentions in this post. Now on to the exciting stuff, I have included my personal highlights from IDS West, including some up-and-coming designers, exciting new product concepts and wonderful, sustainable furniture design. The What the HEL Finland exhibition was definitely a show-stopper last weekend. The exhibition was visually beautiful and colorful with a story driven concept, that displayed cutting edge design mixed with the best in fine arts from Finland. This exhibit was a complete mix of traditional Scandinavian design with a twist of modern day Finish culture. It was hard to not be completely inspired by what each section and area within the exhibition had to offer. 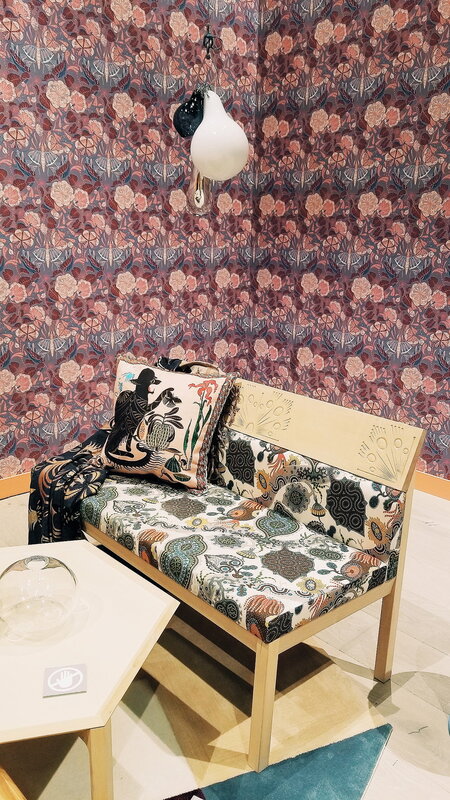 More than 30 designers showcased their work at the What the HEL booth but trend analyst Susanna Bjorklund was the curator of the expo and a speaker at IDS West. As I walked around, I was struck by the beauty and thoughtfulness of each display. I fell in love with this blue alcove that featured a beautiful and sustainable washbasin by Woodio Design. This company has created the first 100% water resistant and cast moldable wood material which I think was simply stunning. It was hard not to be blown away by the sheer energy of this display and the thought provoking concept of traditional, slow living meeting the 21st century. I appreciated how this exhibition was currently ‘on trend’ as well. The display of lush wall coverings and the elaborate paintwork are making a huge comeback in the design world. The folk and art deco inspired illustrations, colours and patterns create an exuberant and delightful atmosphere that I believe is a trend that is here to stay! Simply beautiful! The workplace and office environment has dramatically changed over the decades. This generation is particularly focused on an entrepreneur lifestyle and advancing their careers, therefore more and more time is being spent at the office. It has become a home away from home. This social change, has lead to a change in interior design and architecture. We have become consciously aware, particularly as designers, that the working environment should be designed with the intention of creating a space that is an enjoyable and healthy environment for the user. Enter Buzzispace. I really enjoyed the Buzzispace and Inform booth at IDS West and respected their entire design ethos. The Buzzispace brand started with an interest and love for all things acoustics and from that, their mission grew. They now specialize in creating happy and healthy workspaces through human centric design. They re-imagine and re-design furniture with original acoustic solutions that are functional and also lots of fun! I particularly loved the BuzziVille, which is a totally flexible and modular freestanding system that can moved around the office place to create different spaces depending on the current needs. Did you know that roughly 100,000 chopsticks are thrown away in Vancouver, each day? In a environmentally conscious city like Vancouver, this statistic was quite shocking to me. 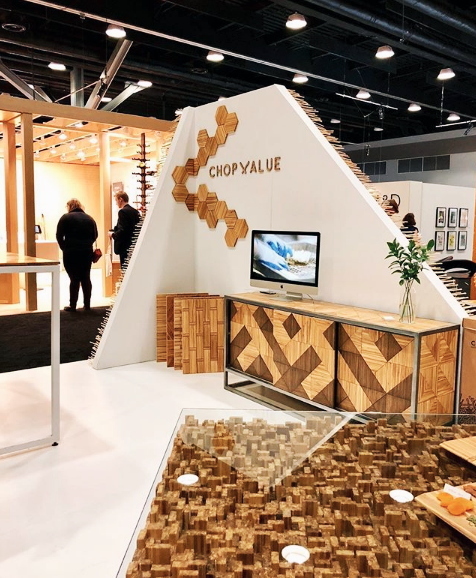 Then I found the Chopvalue exhibition at IDS West. This company offers a remarkable solution to the disposal of chopsticks. They take responsibility in resourcing, processing, engineering and reusing chopsticks to form new applications, such a furniture design and artwork. Next on our list of IDS West highlights in the 100% sustainable (wood free) and customizable furniture from Reforest Design. We fell in love with this beautifully made furniture design and the vibrant, geometric textiles created by this company, who are currently running a kickstarter campaign for their chair design in a bid to preserve the earth’s forests. Bamboo Frame - Each frame is made from bamboo (just like chopvalue’s furniture) and 100% plant-based glues. Bamboo is the perfect product for mass production because it can grown up to 3 inches in a day and reaches maturity in 1-5 years and releases 30% more oxygen while growing than trees! Natural and Recycled Fabrics - The textile covering on each cushion is made from post industrial and consumer recycled hemp, organic cotton and wool. 100% Latex Foam Cushion - That has been tapped from sap of a rubber tree, completely resistant to mildew and mold and not to mention incredibly comfortable to sit on. Take my word for it! We couldn’t talk about our highlights without making a special mention for the Prototype feature at IDS West. A curated showcase of the next generation of designers. This was a platform of products that addressed new ideas for the residential market, featuring work from both professional designers and students. We particularly loved this piece from Ryspot Design. Named ‘The Touch’, it is a visualization of the connection between people and concrete. We thought the organic form on top, cast in resin, resonated perfectly with polished concrete below creating a thoroughly thought provoking sculpture. Another piece I enjoyed in the prototype exhibition was the Peel Credenza cabinet by designer Leah K.S. Amick. This cabinet featured a unique and fun opening detail. Tugging on the tabs opened the cabinet in an unusual ‘peeling’ motion and added mystery and intrigue to this piece. I attended a seminar at IDS West on Friday (trade show day) and the talk was so compelling I wanted to share some of the key points with you. 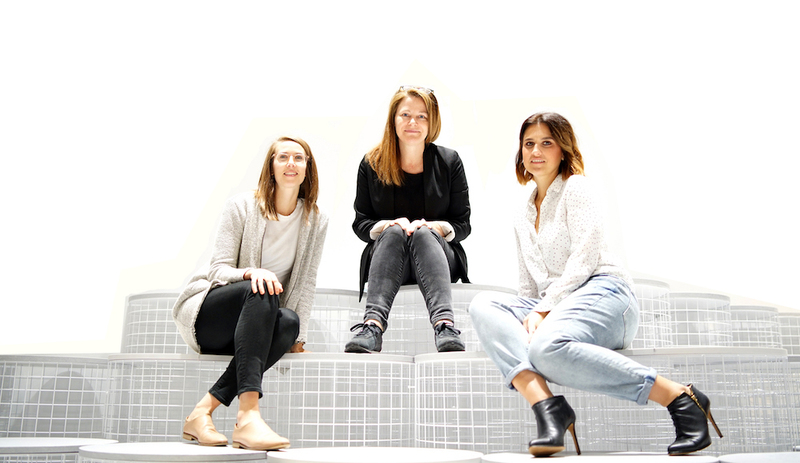 The seminar featured three of North America’s leading female architects, Jing Liu of New York’s SO-IL, Johanna Hurme of Winnipeg’s 5468796 Architecture and Susan Scott of Vancouver’s Scott and Scott Architects. The discussion focused on women entrepreneurs in design, the speakers discussed ways for women to progress their careers in our industry. I took away a few things from that talk and they will be featured in my next blog post. Are you a successful female designer/entrepreneur based in Vancouver? Have you got a story to share about ‘making it’ in the industry? Our next blog will feature the voices of both prominent and up-and-coming designers from the Vancouver area and we’d love to hear from you! Reach out to us for a chance to be featured.